Dimensions: 19L x 27W x 26H in. Ideal for nap time, playtime with meals, the versatile Fisher-Price Infant to Toddler Rocker offers a safe, comfortable chair that soothes with vibrations and motion. The seat is easily washable which keep it new every time. It has a perfect dimension of 19 L x 27 W x 26 H. Its designed to provide the ideal comfort to your child. Starting from a new born infant to a growing toddler, it is suitable for all ages. 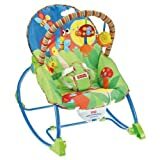 The Fisher Price rocker helps promote security and comfort. Its best suited for working parents who wish to carry their new born with them self to work. The comfort of chair is so good that even long hours of being seated makes your child feel comfortable. The most important part is its ” removal toy bar” for your infant toddler. It can be removed anytime as per your usability. Some of our more products.